SUVs come in different sizes, but they all excel are accommodating passengers with plenty of seats and spacious cabins. 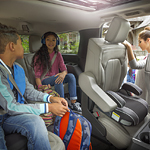 The largest SUVs have two rows of back seats that make it possible transport up to eight people at once, while smaller SUVs provide you with enhanced efficiency and cabin space. Sports utility vehicles also provide more power than most cars on the road today, and many can handle light towing duty. If you have a boat, horse trailer, or motorcycles you want to take on family outings, SUVs can usually handle these loads. Modern SUVs even include advanced technology features like trailer sway control.